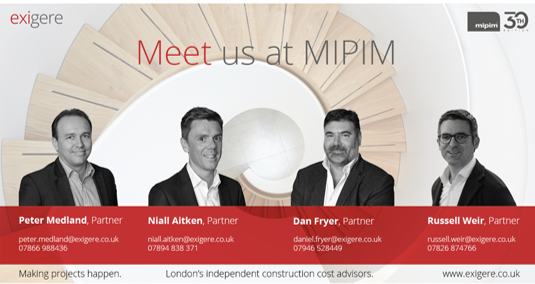 Exigere partners Niall Aitken, Dan Fryer, Peter Medland and Russell Weir will be attending this year’s MIPIM world in Cannes, France from 12-15th March. MIPIM, the world’s leading property market, brings together the most influential players from all international property sectors: office, residential, retail, healthcare, sport, logistics and industrial. Please contact us if you would like to arrange a meeting or catch up, equally if you are not attending MIPIM and would like to catch up back in London please get in touch.